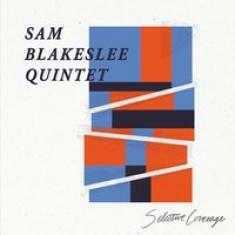 The Sam Blakeslee Quintet has been making headlines for their magnetic approach to contemporary jazz, bridging the gaps between energy and sophistication with their creative arrangements. Their recent studio album, Selective Coverage, is a perfect showcase of their style and personality. The collective's performance on this release is very organic and natural: this album is the product of a talented group of musicians who are able to feed off each other's feelings with an impressive amount of ease and skill. It isn't really easy to combine highly technical abilities with authentic emotional responses, but Selective Coverage achieves this perfect balance beautifully. What really makes this record a stand out contemporary jazz piece is exactly the highly emotional energy that pervades these tunes. Chock full of stunning melodies and irresistible harmonies, Selective Coverage will please anyone from discerning jazz aficionados to casual listeners looking for something new. This distinctive and sophisticated record is a true treasure trove full of amazing songs, which portray all the passion, love, and zeal of this band.